At 02.00 a.m. (CEST), several strange posts began to appear on the Twitter account of the Swedish Social Democratic Party. 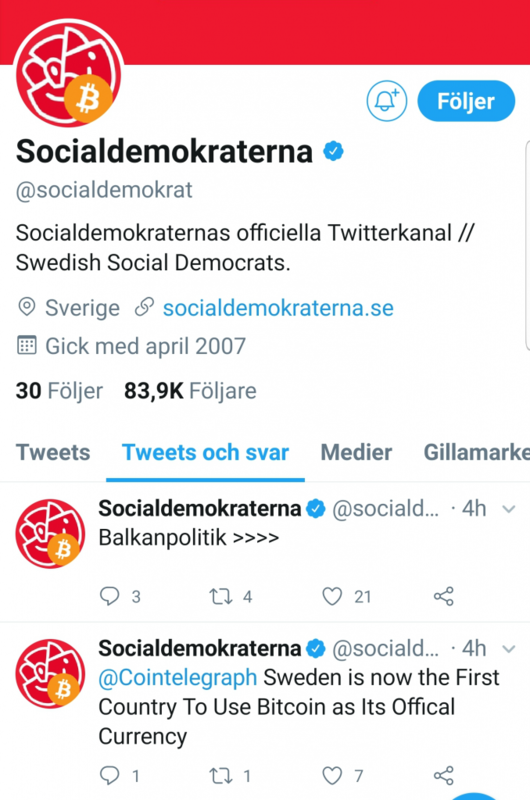 During Monday night (CEST), someone hijacked the Twitter account of the Swedish Social Democratic Party. Among other things, the name of the account was changed to “Bitcoin Democrats”, Swedish newspaper Expressen reports. “It is of course extremely serious, but we will get back to you as soon as we have more information. Right now, we are looking into this and keeping in touch with Twitter”, says Erik Holm at the Swedish Social Democratic Party’s press service to the newspaper. 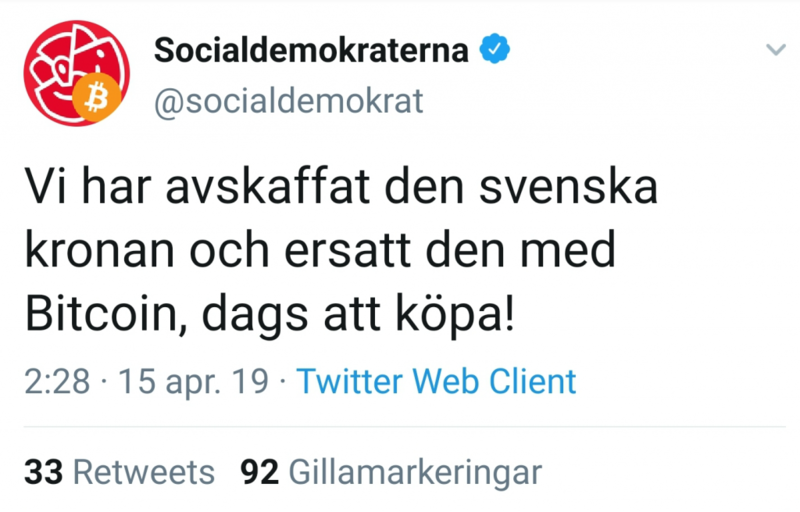 It was at 02.00 a.m. this morning (CEST) when several strange posts began to appear on the Swedish Social Democratic Party’s Twitter account. Among other things, it was claimed that Stefan Löfven resigns as prime minister, but also that the Swedish krona (SEK) would be replaced by bitcoin. The logo for Social Democratic Party was also replaced and a new version with a bitcoin mark on it was uploaded. In addition, someone tweeted to the crypto news site Cointelegraph. It is still unclear who is behind the hijacking of the Twitter account. The Social Democratic Party have reported the incident to the police. At 09.15 a.m. on Monday morning, the posts were removed, Expressen reports. This is not the first time that the Swedish Social Democratic Party are associated with bitcoin. In August last year, the party used the cryptocurrency in a campaign film (in Swedish) against health care privatization.